The English and the Hungarian versions differ significantly. Qualitative and quantitative investigations of polynomial models with special reference to applications in reaction kinetics, population biology, biochemistry etc. We are mainly involved in the mathematical theory of reaction kinetics, which involves nonlinear differential equations and Markovian jump processes. The theory went through a kind of explosion recently, and we joined it in several ways, obtaining detailed results e.g. on existence and stability. Some of our early papers and a previous book are among the highly cited papers. Further, a program package has been written in Mathematica, which treats the reactions also from a structural point of view. Beyond the chemical applicability of our codes and theoretical results, they can be used in other fields such as in Systems Biology, Atmospheric Chemistry, Combustion etc. Let us see a few details. 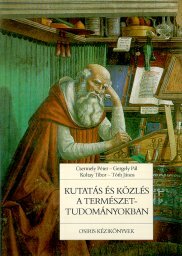 Csermely, P., Gergely, P., Koltay, T., Tóth, J.: Research and Publication in Science, Osiris, Budapest, 1999 (in Hungarian). 1. Science and research: Basic notions. Methods of cognition. What are good scientists like? Where to do research? What to research? Experiments. Evaluation. Models. Ethical and sociological questions. 2. Literature and the libraries: Use and structure of the literature. The process of collecting literature. 3. Informal communication: Communication inside the laboratory and between laboratories. Electronic communication. 4. Formal communication: Publications. Scientific results in the media. The role of media. Conferences. How to write papers in English? 5. Proposals and projects: the financial background of research. Érdi, P., Tóth, J.: Mathematical Models of Chemical Reactions. 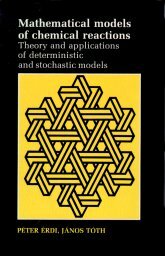 Theory and Applications of Deterministic and Stochastic Models, Manchester University Press, Manchester, Princeton University Press, Princeton, 1989. 1. Chemical kinetics: a prototype of nonlinear science. 2. The structure of kinetic models: Temporal processes. Properties of process-time. Structure of the state-space. Nature of determination. 3. Stoichiometry: the algebraic structure of complex chemical reactions. 4. Mass action kinetics deterministic models: Exotic reactions. Multistationarity. Oscillatory reactions. Chaotic phenomena. Inverse problems. Lumping. 5. Continuous time discrete state stochastic models: Internal fluctuations. Fluctuation-dissipation theorem. Enzyme kinetics. Stationary distributions. External fluctuations. 6. Chemical reactions accompanied by diffusion. 7. Applications: Biochemistry. Neurochemistry. Lotka-Volterra models. Ecology. Chemical circuits. Selection. Szili, L., Tóth, J.: Mathematics and Mathematica, ELTE Eötvös Kiadó, Budapest, 1996. 1. Mathematical program packages: Symbolic packages (CAS: computer algebra systems). Numerical packages. 2. Mathematica fundamentals: Basic principles. External connections. Sources of information. 3. Chapters of mathematics: Fundamentals. Expressions. Equations. Calculus. Differential equations. Discrete mathematics. Geometry. Linear algebra. Number theory. Probability theory. Mathematical statistics. 4. Programming Mathematica: Elements. How to make programs faster? Advice to programming. Writing your own packages. 5. Applications outside mathematics: Business graphics. Sound. Time. Physics. Geography. Chemistry. Index. Full text, supported with TÁMOP. Tóth, J.; Simon, P.: Differential equations. Introduction into the theory and its applications, TYPOTEX, Budapest, 2005 (In Hungarian). 2009: Second edition. 2. Basic notions, motivation. Elementary qualitative and quantitative methods. Existence and uniqueness results. Tóth, J., Simon, L. P., Csikja R.: Problem book on differential equations, Budapest, 2013. 7. Element of stability theory. Arányi, P.; Tóth, J.: A full stochastic description of the Michaelis-Menten reaction for small systems, Acta Biochimica et Biophysica Academiae Scientificarum Hungariae 12 (4) (1977), 375-388. zipped gifs. The Kolmogorov-equations for the stochastic model of the Michaelis-Menten reaction is explicitly solved by a method in the special case when the number of enzyme molecules is exactly one, which can also be extended for cases with a few enzyme molecules. The important differences between the stochastic and deterministic approaches and their biological significance is analyzed. Beside the symbolic solution of the time course of the irreversible reaction the equilibrium is also described for the reversible case. Comparisons are made with the usual steady state approximation. Blickle, T.; Halász, G.; Tóth, J.: Structures, hypergraphs and knowledge representation in chemical engineering science. I - Problem formulation, The International Journal for Artificial Intelligence in Engineering 5 (3) (1990), 142-152. Brochot, C., Tóth, J.; Bois, F.: Lumping in pharmacokinetics, Journal of Pharmacokinetics and Pharmacodynamics, 32 (5-6) (2005), 719-736. online. manuscript here. Pharmacokinetic models simplify biological complexity by dividing the body into interconnected compartments. The time course of the chemical's amount in each compartment is then expressed as the solution to a system of ordinary differential equations. Difficulties arise when the model contains more variables and parameters than comfortable for mathematical and computational treatment. To overcome such difficulties the new and powerful tools of lumping are applied, which are aimed at reducing a differential system by aggregating several variables into one. The lumped model is a differential equation system, whose variables are interpretable in terms of variables of the original system. The reduced model is usually required to satisfy some constraints: it may be necessary to keep state variables of interest for prediction unlumped. For this purpose constrained lumping methods have are also available. After presenting the theory, we study, here, through practical examples, the potential of such methods in toxico/pharmacokinetics. We first simplify a 2-compartment pharmacokinetic model by symbolic lumping. We then explore the reduction of a 6-compartment physiologically based pharmacokinetic model for 1,3-butadiene with numerical constrained lumping. Császár, A.; Érdi, P.; Jicsinszky, L.; Tóth, J.; Turányi, T.: Several exact results on deterministic exotic kinetics, Zeitschrift für Physikalische Chemie, (Leipzig) 264 (1983), 449-463. Csikja, R.; Tóth, J.: Blow up in polynomial differential equations, Enformatika. International Journal of Applied Mathematics and Computer Sciences 4 (2) (2007), 728-733. manuscript here. Egri, E.; Tóth, J.; Brochot, C.; Bois, F.: Symbolic lumping of some catenary, mamillary and circular compartmental systems (in preparation). Érdi, P.; Kiss, T.; Tóth, J.; Ujfalussy, B.; Zalányi, L.: From systems biology to dynamical neuropharmacology: proposal for a new methodology, Systems Biology, IEEE Proc. 153 (4) (2006), 299-308. The concepts and methods of systems biology are extended to neuropharmacology in order to test and design drugs for the treatment of neurological and psychiatric disorders. Computational modelling by integrating compartmental neural modelling techniques and detailed kinetic descriptions of pharmacological modulation of transmitter-receptor interaction is offered as a method to test the electrophysiological and behavioural effects of putative drugs. Even more, an inverse method is suggested as a method for controlling a neural system to realise a prescribed temporal pattern. In particular, as an application of the proposed new methodology, a computational platform is offered to analyse the generation and pharmacological modulation of theta rhythm related to anxiety. Érdi, P., Tóth, J.: What is and what is not stated by the May-Wigner theorem?, J. Theor. Biol. 145 (1990), 137-140. Gaveau, B., Moreau, M., Tóth, J.: Decay of the metastable state: different predictions between discrete and continuous models, Letters in Mathematical Physics 37 (1996), 285-292. Gaveau, B.; Moreau, M.; Tóth, J.: Master equation and Fokker-Planck equation: Comparison of entropy and rate constants, Letters in Mathematical Physics 40 (1997), 101-115. Gaveau, B.; Moreau, M.; Tóth, J.: Dissipation of energy and information in nonequilibrium reaction-diffusion systems, Physical Review E 58 (11) (1998), 5351-5354. manuscript. Gaveau, B.; Moreau, M.; Tóth, J.: Variational nonequilibrium thermodynamics of reaction-diffusion systems. I. The information potential, Journal of Chemical Physics 111 (17) (1999), 7736-7747. manuscript. Gaveau, B.; Moreau, M.; Tóth, J.: Variational nonequilibrium thermodynamics of reaction-diffusion systems. II. Path integrals, large fluctuations and rate constants, Journal of Chemical Physics 111 (17) (1999), 7748-7757. manuscript. Gaveau, B.; Moreau, M.; Tóth, J.: Information potential and transition to criticality for certain two-species systems, Physica A 277 (3/4) (2000), 455-468. manuscript. manuscript. Gaveau, B.; Moreau, M.; Tóth, J.: Scenarios for self-organized criticality in dynamical systems, Open Sys. & Information Dyn. 7 (4) (2000), 297--308. manuscript. We analyze the concept of Self-Organized Criticality in the case of dynamical systems, in particular for nonlinear reactive systems including arbitrary numbers of species and chemical reactions. We find mathematical conditions that allow for the existence of this behaviour. It is shown that these quite restrictive conditions can nevertheless be satisfied for physical reasons, in particular in chemical kinetics or population dynamics. It can be concluded that SOC, although apparently highly non-generic, should be observed in many natural dynamical systems. These results are applied for homogeneous and inhomogeneous catalytic chemical systems. Gaveau, B.; Moreau, M.; Tóth, J.: Variational nonequilibrium thermodynamics of reaction-diffusion systems. III. Progress variables and dissipation of energy and information, Journal of Chemical Physics 115 (2) (2001), 680-690. manuscript. Halász, G.; Tóth, J.; Hangos, K. M.: Energy-optimal operation conditions of a tunnel kiln, Computers and Chemical Engineering 12 (2/3) (1988), 183-187. Halmschlager, A.; Szenthe, L.; Tóth, J.: Invariants of kinetic differential equations, Electronic Journal of the Qualitative Theory of Differential Equations, 14 (2004), 1-14. Polynomial differential equations showing chaotic behavior are investigated using polynomial invariants of the equations. This tool is more effective than the direct method for proving statements like the one: the Lorenz equation cannot be transformed into an equation which would be a mass action type kinetic model of a chemical reaction. Hangos, K. M.; Tóth, J.: Maximum likelihood estimation of reaction-rate constants, Computers and Chemical Engineering 12 (2/3) (1988), 135-139. This paper deals with ratio-dependent predator-prey systems with delay. We will investigate under what conditions delay cannot cause instability in higher dimension. We give an example when delay causes instability. Mathematica programs to be read by MathematicaPlayer, to use by Mathematica 6. Kovács, B.; Tóth, J.: Estimating reaction rate constants with neural networks, Enformatika. International Journal of Applied Mathematics and Computer Sciences 4 (2) (2007), 515--519. manuscript here. Kovács, K.; Vizvári, B.; Riedel, M.; Tóth, J.: Decomposition of the permanganate/oxalic acid overall reaction to elementary steps based on integer programming theory, Physical Chemistry, Chemical Physics 6 (2004), 1236-1242. manuscript, data. Kutas, T.; Tóth, J.: A stochastic model of phytoplankton dynamics in Lake Balaton, Journal of Statistical Computation and Simulation 21 (1985), 241-264. Li, G.; Tomlin, A. S.; Rabitz, H.; Tóth, J.: A general analysis of approximate nonlinear lumping in chemical kinetics. I. Unconstrained lumping, Journal of Chemical Physics 101 (2) (1994), 1172-1187. Nagy, I.; Kovács, B.; Tóth, J.: Detailed balance in ion channels: Applications of Feinberg's theorem, Reaction Kinetics and Catalysis Letters 96 (2) (2009), 263-267. manuscript here. Rózsa, Z.; Tóth, J.: Exact linear lumping in abstract spaces, Electronic Journal of the Qualitative Theory of Differential Equations, 21 (2004), 1-20. Exact linear lumping has earlier been defined for a finite dimensional space, that is, for the system of ordinary differential equations y'=f o y as a linear transformation M for which there exists a function f^ such that y^:=My itself obeys a differential equation y^'=f^ o y^. Here we extend the idea for the case when the values of y are taken in a Banach space. The investigations are restricted to the case when f is linear. Many theorems hold for the generalization of exact lumping, such as necessary and sufficient conditions for lumpability, and relations between the qualitative properties of the original and the transformed equations. The motivation behind the generalization of exact lumping is to apply the theory to reaction-diffusion systems, to an infinite number of chemical species, to continuous components, or to stochastic models as well. Schneider, K. R., Wegner, B., Tóth, J.: Qualitative analysis of as model for synaptic slow waves, J. Math. Chem. 1 (1987), 219-234. Schuman, B.; Tóth J.: No limit cycle in two species second order kinetics, Bull. sci. math. 127 (2003), 222-230. manuscript. Szili, L.; Tóth, J.: Numerical and symbolic applications of Mathematica, Mathematica Pannonica 10 (1) (1999), 83-92. Tomlin, A. S.; Li, G.; Rabitz, H.; Tóth, J.: A general analysis of approximate nonlinear lumping in chemical kinetics. II. Constrained lumping, Journal of Chemical Physics 101 (2) (1994), 1188-1201. Tóth, J.: Poissonian stationary distribution in a class of detailed balanced reactions, Reaction Kinetics and Catalysis Letters 18 (1-2) (1981), 169-173. 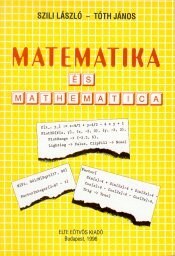 Tóth, J.: Elementa traktado de Wiener-filtrado, Matematiko Translimen 6 (1983), 21-23. Tóth, J.: Bendixson-type theorems with applications, Zeitschrift für Angewandte Mathematik und Mechanik 67 (1) (1987), 31-35. Tóth, J.: A functional equation related to random fields, Revue Roumaine de Mathématiques Pures et Appliquées 37 (3) (1992), 261-264. Tóth, J.: On the equations of chemical kinetics, Nonlinear Vibration Problems-Zagadnenia Drgan Nieliniowych 25 (1993), 447-457. Tóth, J., Hárs, V.: Orthogonal transforms of the Lorenz- and Rössler-equations, Physica 19D (1986), 135-144. manuscript. It is shown that none of the proper or improper orthogonal transformations transforms the Lorenz-equation into a kinetic equation, i.e. into an equation representing reasonable chemistry. It is also shown that none of the proper orthogonal transformations transforms a model by Rössler into a kinetic model either. The importance of the presence of negative cross-effects is hereby emphasized. Tóth, J., Hárs, V.: Specification of oscillating chemical models starting form a given linearized form, Theor. Chim. Acta 70 (1986), 143-150. manuscript. Tóth, J., Li, G., Rabitz, H., Tomlin, A. S.: The effect of lumping and expanding on kinetic differential equations, SIAM J. Appl. Math. 57 (6) (1997), 1531-1556. Tóth, J.; Rospars, J.-P.: Dynamic modelling of biochemical reactions with applications to signal transduction: Principles and tools using Mathematica}, BioSystems, 79 (2005), 33-52. Tóth, J.; Szili, L.; Zachár, A.: Stability of polynomials, Mathematica in Education and Research 7 (2) (1998), 5-12. Zipped Mathematica notebook. Tóth, J.; Ván, P.: Applying a list of functions to an argument: a dual of Map, Mathematica in Education and Research 9 (3/4) (2000), 58-63. Mathematica notebook. Turányi, T.; Bérces, T.; Tóth, J.: The method of quasy-stationary sensitivity analysis, Journal of Mathematical Chemistry 2 (4) (1988), 401-409. Turányi, T.; Tóth, J.: Comments to an article of Frank-Kamenetskii on the Quasi-Steady-State Approximation, Acta Chimica Hungarica-Models in Chemistry 129 (6) (1992), 903-914. The mesoscopic nonequilibrium thermodynamics of a reaction-diffusion system is described by the master equation. The information potential is defined as the logarithm of the stationary distribution. The Fokker-Planck approximation and the Wentzel--Kramers--Brillouin method give very different results. The information potential is shown to obey a Hamilton-Jacobi equation, and from this fact general properties of this potential are derived. The Hamilton-Jacobi equation is shown to have a unique regular solution. Using the path integral formulation of the Hamilton-Jacobi approximation of the master equation it is possible to calculate rate constants for the transition from one well to another one of the information potential and give estimates of mean exit times. In progress variables, the Hamilton-Jacobi equation has always a simple solution which is a state function if and only if there exists a thermodynamic equilibrium for the system. An inequality between energy and information dissipation is studied, and the notion of relative entropy is investigated. A specific two-variable system and systems with a single chemical species are investigated in detail, where all the defined relevant quantities can be calculated explicitly. Tóth, J.: On some problems of modelling in reaction kinetics, In: Bulletin of the University of Agricultural Sciences, 75th Anniversary Edition, Vol. II, Gödöllő, (Gy. Füleky, ed.) (1995-96), pp. 51-58. Tóth, J.; Szili, L.; Érdi, P.: Chemical reaction kinetics as a prototype of nonlinear science, In: The Paradigm of Self-Organization II, (London) (G.J. Dalenoort ed. ), Gordon and Breach, 1994, pp. 184-201. Érdi, P.; Grőbler, T.; Tóth, J.: On the classification of some classification problems, In: International Symposium on Information Physics, (Iizuka, Fukuoka, Japan) Kyushu Institute of Technology, 1993, pp. 110-117. Érdi, P.; Réti, P.; Tóth, J.: Some investigations in qualitative reaction kinetics, In: Proceedings of the Congres International "Contribution des Calculateurs electroniques au developpement du Genie Chimique et de la Chemie Industrielle", (Paris, du 7 au 10 Mars, 1978) 1978, pp. 43-47. Érdi, P.; Tóth, J.: On the theory of reacting mixtures, In: Proceedings of the Third Conference on Applied Chemistry. Unit Operations and Processes, (Veszprém, Hungary, 29-31 Aug. 1977) 1977, pp. 1-8. Érdi, P.; Tóth, J.: Oscillatory phenomena at the synapse, In: Advances in Physiological Sciences, (Satellite Conference to the XXVIII International Congress of Physiological Sciences, Budapest, July 13-19, 1980) Mathematical and Computational Methods in Physiology (L. Fedina, B. Kanyár, B. Kocsis, M. Kollai eds. ), 34 Pergamon Press - Akadémiai Kiadó, Budapest, 1981, pp. 113-121. Érdi, P.; Tóth, J.: Anomalous stochastic kinetics, In: Chemical Reactivity in Liquids. Fundamental Aspects, (Paris, Sept. 7-11, 1987) (M. Moreau and P. Turq eds. ), Plenum Press, New York and London, 1988, pp. 511-516. Érdi, P.; Tóth, J.: Molecular computation: a dynamic approach, In: COMBIO'94 (Summer workshop on the computational modelling in biosciences), (Nyíregyháza, 1994.08.23) (I. Erényi, I. Molnár, K. Tarnay eds. ), RÍM Kiadó, Nyíregyháza, 1994, pp. 41-52. Érdi, P.; Tóth, J.: Towards a dynamic neuropharmacology: Integrating network and receptor levels, In: Brain, Vision and Artifical Intelligence, (M. De Gregorio, V. Di Maio, M. Frucci and C. Musio eds. ), Lecture Notes in Computer Science 3704, Springer Verlag, Berlin, Heidelberg, 2005, pp. 1-14. .pdf file. Érdi, P.; Tóth, J.; Hárs, V.: Some kinds of exotic phenomena in chemical systems, In: Colloquia Mathematica Societatis János Bolyai, (Szeged, Hungary, 1979) Qualitative Theory of Differential Equations (M. Farkas ed. ), 30 North-Holland - János Bolyai Mathematical Society, Budapest, 1981, pp. 205-229. Garay, M. B.; Csikja, R.; Tóth, J.: Some chaotic properties of the beta-hysteresis transformation, Proc. of the 2008 International Symposium on Nonlinear Theory and its Applications, Danubius Health Spa Resort Helia, Budapest, Republic of Hungary, September 7-10, 2008, pp. 191-194. A two-valued piecewise-linear, constant slope, 1D transformation is defined as a simplified model for hysteresis. By using Góra's S-matrix and classical results on Rényi's beta-transformation x|-->beta x (mod 1) the density function of the induced absolutely continuous ergodic measure is determined. Interesting simulation results reveal the chaos established. Gaveau, B.; Moreau, M.; Tóth, J.: Path integrals and non-equilibrium thermodynamics, In: Path integrals from peV to TeV, (Florence, 1998), World Sci. Publishing, River Edge, NJ, 1999, pp. 52-58. Halmschlager, A.; Tóth, J.: Über Theorie und Anwendung von polynominalen Differentialgleichungen, In: Wissenschaftliche Mitteilungen der 16. Frühlingsakademie, ISBN 963 214 1180, Mai 19-23, 2004, München-Wildbad Kreuth, Deutschland. Technische und Wirtschaftswissenschaftliche Universit\"at Budapest, Institut f\"ur Ingenieurweiterbildung, Budapest, 2004, pp. 35--40. doc file, pdf file. Polynomial equations so important in different fields of applications, especially in chemistry, are investigated. The literature is reviewed with the aim of possible applications of pure mathematical results in the field of chemical kinetics. Finally an example is treated in detail showing how to transform a mass action type kinetic equation into a homogeneous quadratic mass action type kinetic equation. The problem of transforming back is also discussed. Hangos, K. M.; Tóth, J.: Maximum likelihood estimation of reaction rate constants, In: Proceedings of the MATCHEM, (Conference on Mathematical Methods in Chemical Engineering, Balatonfüred, Hungary, 5-8 May, 1986) Hungarian Chemical Society, Budapest, 1986, pp. 183-188. The induced kinetic differential equations of reactions with mass action type kinetics are characterized within the class of polynomial differential equations: it is shown that a polynomial differential equation is kinetic if and only if it contains no negative cross effect. A constructive proof is given to prove sufficiency of the condition. Hárs, V.; Tóth, J.; Érdi, P.; Hámori, J.: A formal dynamic model of the development of Purkinje dendritic spines, In: Advances in Physiological Sciences, (Satellite Conference to the XXVIII International Congress of Physiological Sciences, Budapest, July 13-19, 1980) Mathematical and Computational Methods in Physiology (L. Fedina, B. Kanyár, B. Kocsis, M. Kollai eds. ), 34 Pergamon Press - Akadémiai Kiadó, Budapest, 1981, pp. 239-243. Kutas, T.; Tóth, J.: Stochastic and deterministic approach to modelling a lake ecosystem, In: Proceedings of Simulation of Systems in Biology and Medicine, (SYSI '83, Prague, 1983) 1983. Kutas, T.; Tóth, J.: Simulation of a lake ecosystem using deterministic and stochastic models, In: SIMULA Information, (Proceedings of the Twelfth SIMULA User's Conference, Budapest, 29-31 Aug. 1984) Norwegian Computing Center, Oslo, 1984, pp. 107-110. Tóth, J.: A mass action kinetic model of neurochemical transmission, In: Dynamic Phenomena in Neurochemistry and Neurophysics: Theoretical Aspects, (Budapest, Aug. 21-23, 1984) (P. Érdi ed. ), MTA KFKI, Budapest, 1985, pp. 52-55. Tóth, J.: Notes on coexistence, In: Proceedings of the 11th International Conference on Nonlinear Oscillations, (Budapest, Aug. 17-23, 1987) (M. Farkas, V. Kertész, G. Stépán eds. ), János Bolyai Mathemetical Society, Budapest, 1987, pp. 844-847. Tóth, J.: Structure of the state space in stochastic kinetics, In: Proceedings of the 5th Pannonian Symposium on Mathematical Statistics, (Visegrád, Hungary, 1985) (W. Grossman, J. Mogyoródi, I. Vincze, W. Wertz eds. ), János Bolyai Mathematical Society, Budapest, 1987, pp. 361-369. Tóth, J.: Contribution to the general treatment of random processes used in chemical reaction kinetics, In: Transactions of the Tenth Prague Conference on Information Theory, Statistical Decision Functions, Random Processes, (Prague, July 7-11, 1986) Academia (Publishing House of the Czechoslovak Academy of Sciences), Prague, 1988, pp. 373-379. Tóth, J.: Formal Kinetics with Applications, 6th World Multiconference on Systemics, Cybernetics and Informatics (July 14-18, 2002, Orlando, FL, USA), Vol. XI (Computer Science II) (N. Callaos, M. Morgenstern and B. Sanchez eds. ), pp. 573-576. Mathematica notebook. Tóth, J.; Brochot, C., Bois, F.: Lumping in toxicokinetics, Poster presented at the ESF REACTOR workshop "Nonlinear phenomena in chemistry" Budapest, 24-27 Jan. 2003. poster. Tóth, J.; Érdi, P.: On the theory of "pure" reaction kinetics, In: Proceedings of the Third Conference on Applied Chemistry. Unit Operations and Processes, (Veszprém, Hungary, 29-31 Aug. 1977) 1977, pp. 71-76. 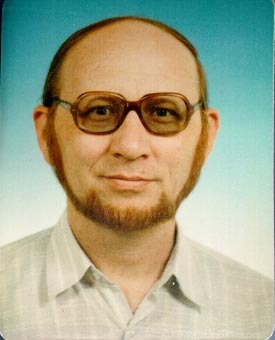 Tóth, J.; Érdi, P.: Determination of reaction rate constants of complex chemical reactions from equilibrium fluctuations, In: Proceedings of the 5th Symposium on Computers in Chemical Engineering, (Czechoslovakia, 5-9 Oct. 1977) 1977, pp. 321-324. Tóth, J.; Érdi, P.: Kinetic symmetries: Some hints, In: Chemical Reactivity in Liquids. Fundamental Aspects, (Paris, Sept. 7-11, 1987) (M. Moreau and P. Turq eds. ), Plenum Press, New York and London, 1988, pp. 517-522. Tóth, J.; Érdi, P.; Sipos, T.: Stochastic simulation of complex chemical reactions by digital computer, In: Proceedings of the 2nd Symposium on Computers in Chemical Engineering, (Ústí nad Labem, Czechoslovakia, Nov. 1973) 1973, pp. 83-89. Tóth, J.; Halász, G. Gy. : Estimation of tunnel kiln parameters, In: Proceedings of the 8th IFAC/IFORS Symposium on Identification and System Parameter Estimation, (Beijing, 27-31 Aug. 1988) (Han-Fu Chen ed. ), IFAC by Pergamon Press, China, 1988, pp. 1559-1563. Tóth, J.; Hangos, K. M.; Halász, G. Gy. : Energy-optimal operation conditions of a tunnel kiln, In: Proceedings of the MATCHEM, (Conference on Mathematical Methods in Chemical Engineering, Balatonfüred, Hungary, 5-8 May, 1986) Hungarian Chemical Society, Budapest, 1986, pp. 435-442. Tóth, J.; Kovács, K.; Vizvári, B.; Riedel, M.: Computer assisted study of the mechanism of the permanganate/oxalic acid reaction, Poster presented at the ESF REACTOR workshop "Nonlinear phenomena in chemistry" Budapest, 24-27 Jan. 2003. poster. Tóth, J.; Kutas, T.; Csáki, P.: Estimation and prediction in a stochastic lake eutrophication model, In: Proceedings of Simulation of Systems in Biology and Medicine, (SYSI '84, Prague, 1984) 1984. Tóth, J.; Li, G.; Rabitz, H.; Tomlin, A. S.: Reduction of the number of variables in dynamic models, In: Complex Systems in Natural and Economic Sciences, (Mátrafüred, 19-22 September, 1995.) (K. Martinás, M. Moreau eds. ), ELFT, Budapest, 1996, pp. 17-34. Tóth, J.; Török, T. L.: Stationary distributions in stochastic kinetics, In: Advances in Physiological Sciences, (Satellite Conference to the XXVIII International Congress of Physiological Sciences, Budapest, July 13-19, 1980) Mathematical and Computational Methods in Physiology (L. Fedina, B. Kanyár, B. Kocsis, M. Kollai eds. ), 34 Pergamon Press - Akadémiai Kiadó, Budapest, 1981, pp. 103-111. Csima, G.; Szirmai J.; Tóth, J.: Iso-Optic Curve of the Ellipse, from The Wolfram Demonstrations Project. Kabai, S.; Tóth, J.: Jefferson National Expansion Memorial, from The Wolfram Demonstrations Project. Kabai, S.; Tóth, J.: Building Frame with Catenary Roof Beams, from The Wolfram Demonstrations Project. Kabai, S.; Tóth, J.: Maximum Size of Involute Gear Teeth, from The Wolfram Demonstrations Project. Várdai, J., Tóth, J.: Hopf Bifurcation in the Brusselator, from The Wolfram Demonstrations Project. Egri, E.; Tóth, J.: Symbolic lumping of some catenary, mamillary and circular compartmental systems, In: Book of Abstracts, MaCS'06: 6th Joint Conference on Mathematics and Computer Science, (Pécs, Hungary, July 12-15, 2006), p. 35. Halmschlager, A.; Szenthe, L.; Tóth, J.: Invariants of kinetic differential equations, 7th Colloquium on the Qualitative Theory of Differential Equations, July 14-18, 2003, Szeged, Hungary, abstract, dvi file, pdf file. Kiss, K., Tóth, J.: n-dimensional ratio-dependent predator-prey systems with memory, Poster, Second ESF FUNCDYN Conference on Functional Dynamics, Rothenburg ob der Tauber, Germany, 15 - 18 September 2008, p. 15. poster. Rózsa, Z.; Tóth, J.: Exact linear lumping in abstract spaces, 7th Colloquium on the Qualitative Theory of Differential Equations, July 14-18, 2003, Szeged, Hungary, abstract. Sipos-Szabó, E., Tóth, J., Pál, I., Zsély, I. Gy., Turányi, T., Csikász-Nagy, A.: Sensitivity analysis of a generic cell-cycle model, Poster, Second ESF FUNCDYN Conference on Functional Dynamics, Rothenburg ob der Tauber, Germany, 15-18 September 2008, p. 15. poster. Tóth, J.: Old methods wanted: Applications of deterministic and stochastic formal reaction kinetics to systems biology, In: Large Scale Random Graph Methods for Modeling Mesoscopic Behavior in Biological and Physical Systems, August 28--September 4, Budapest, 2006. Tóth J. (based upon joint work with Nagy, A. L. (BUTE), Papp, D. (Rutgers)): Detailed balance in the models of chirality (Investigating the dynamics of biological models using the Mathematica package ReactionKinetics, Modellezés az élettudományokban, A Magyar Tudomány Ünnepe, Szeged, 2010. december 3.
it calculates the graph-theoretic and linear algebraic quantities which allow to deduce statements on the qualitative behavior of the concentration of the different species. Burger, M., Field, R.: Oscillations and travelling waves in chemical systems, Wiley, New York, 1985. Császár, A., Jicsinszky, L., Turányi, T.: Generation of model reactions leading to limit cycle behaviour, Reaction Kinetics and Catalysis Letters 18 (1/2), 65-71 (1981). Farkas, Gy. : Local controllability of reactions, Journal of Mathematical Chemistry 24 (1) (1998), 1-14. Farkas, Gy. : On local observability of reactions, Journal of Mathematical Chemistry 24 (1) (1998), 15-22. Farkas, Gy. : Kinetic lumping schemes, Chemical Engineering Science 54 (1999), 3909-3915. Garay, B. M.; Várdai, J.: Interpolation of dynamic equations on time scales, J. Difference Eq. Appl. 13 (8/-9) (2007), 847-854. Horváth, Zsófia: Effect of lumping on controllability and observability, Poster presented at the Colloquium on Differential and Difference Equations dedicated to Prof. Frantiek Neuman on the occasion of his 65th birthday, Brno, Czech Republic, September 4 - 6, 2002 manuscript. Hoyle, M. H.: Transformations - An introduction and a bibliography, Int. Stat. Rev. 41 (2), (1973), 203-223. Inselberg, A.: Don't panic ... just do it parallel! Computational Statistics 14 (1999), 53-77. Izsák, F.; Lagzi, I.: Simulation of Liesegang pattern formation using a discrete stochastic model, Chemical Physics Letters 371 321-326. Kirschner, I.; Bálint, Á.; Csikja, R.; Gyarmati, B.; Balogh, A.; Mészáros, Cs. : An approximate symbolic solution for convective instability flows in vertical cylindrical tubes, Journal of Physics A, Mathematical and Theoretical 40 (2007) 9361-9369. Kovács, B.; Szalay, M.; Imre, S.: Modelling and quantitative analysis of LTRACK - A novel mobility management algorithm, Mobile Information Systems 2 (1) (2006) 21-50. Kozma, R., Th. : Horosphere Packings of the (3, 3, 6) Coxeter Honeycomb in Three-Dimensional Hyperbolic Space, from The Wolfram Demonstrations Project. Ladics, T.: The analysis of the splitting error for advection-reaction problems in air pollution models, Időjárás -. (in press). manuscript and figures. Ladics, T.: Application of Operator Splitting to Solve Reaction Diffusion Equations, arXiv:1011.4810 manuscript and figures. Ofella, P. (with Carl Woll): Robinson Tiling, from The Wolfram Demonstrations Project. Orlov, N. N., Rozonoer, L. I.: The macrodynamics of open systems and the variational principle of the local potential, J. Franklin Inst. 318(1984) 283-314 and 315-347. Papp, D., Vizvári, B.: Effective solution of linear Diophantine equation systems with an application in chemistry RUTCOR Research Reports 28-2004. Recski, A.: Calculus exercises with and without Mathematica, New Haven, 1995. Rényi, A.: Foundations of probability, Holden-Day Inc., San Francisco, Calif., 1970. ZBL 0203.49801, MR 41:9314. Scott, S. K.: Chemical Chaos, Oxford Univ. Press, 1991. Tóth, Ágnes: Fast edge colouring of graphs, 2007 Wolfram Technology Conference. Turányi, T.: Sensitivity analysis of complex kinetic systems: Tools and applications, J. Math. Chem. 5 (1990) 203-248. Volpert, A. I., Hudjaev, S. I.: Analysis in classes of discontinuous functions and the equations of mathematical physics, Martinus Nijhoff Publ., Dordrecht, Boston, Lancaster, 1985. Wehrl, A.: General properties of entropy, Rev. Mod. Phys. 50 (2) (1978) 221-260. Zachár, A.: Comparison of transformations from nonkinetic to kinetic models, Acta Chimica Hungarica - Models in Chemistry 135 (3) (1998), 425-434. Zhang, S. Y.: Bibliography on Chaos, World Scientific, Singapore, New Jersey, London, Hong Kong, 1991.